While helping sell T-Shirts at the Irish Music Festival's Galway Days, I drew some attention by juggling the shirts. View photo here. The Anchorage Folk Festival provided me a slot to do a little club juggling with the help of bluegrass music, featuring my daughter Amanda Lynn Kerr on fiddle. New Years Eve was a great day for juggling fire in downtown Anchorage Alaska. For nearly two hours I juggled fire in front of the Egan Center on 5th avenue as a warm up to the big fireworks shot off the roof of the Egan Center. Thank you to the Downtown Partnership. Although there seems to be great interest in starting Anchorage Juggling Club meetings, suitable space has yet to be found hold the meetings. Any leads on finding space to juggle would be most appreciated. 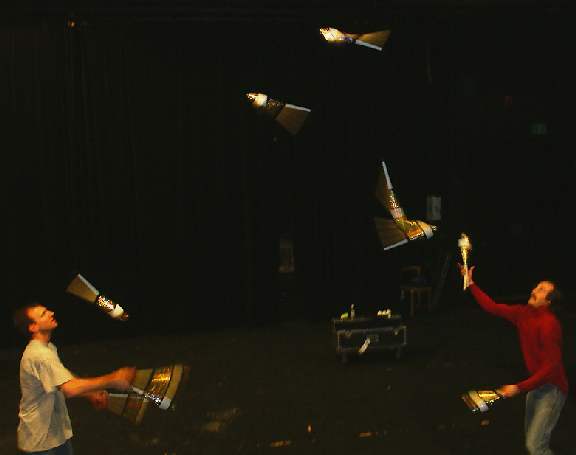 Owen Morse of the Passing Zone, and yours truly, pass 9 clubs in Anchorage on January 29th, 2005 at a juggling workshop. It wasn't such a big deal for Owen, but it was the first time ever for me. It sure makes for better juggling when you pass with a former world record-holder. Owen and his partner Jon Wee are the first duo to ever pass 11 clubs. The Passing Zone had a fabulous show in Anchorage on February 5, 2005, at the Atwood Concert Hall -- Thanks to Robert Hayes for taking the picture.